On July 6th, the Chilcot Report will pass judgment on the UK’s role in the 2003 Iraq War. While publication has suffered endless setbacks, Lung Theatre conducts its own investigation into Tony Blair’s ill-fated invasion in this timely production. Chilcot is documentary theatre as dramatic reconstruction. 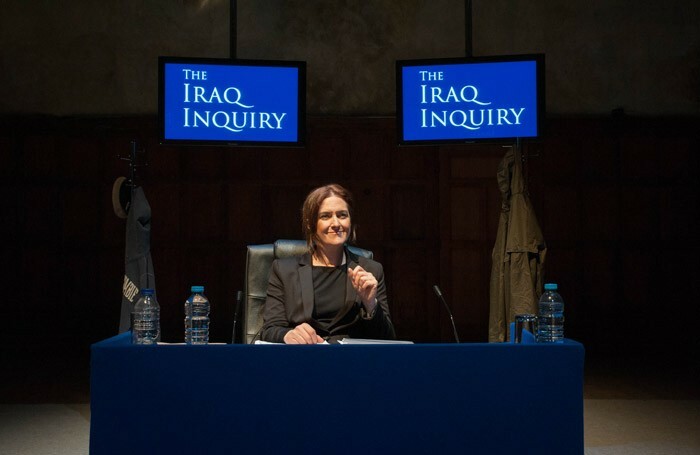 Director Matt Woodhead and journalist Richard Norton-Taylor splice together the public investigation of The Iraq Inquiry with the off-the-record testimonial of veterans, Iraqi’s and families. Meanwhile, James Turner Donnelly’s traverse staging replicates a conference centre while Owen Crouch’s sound punctuates the action with snatches of news broadcasts. Verbatim theatre is problematic. By invoking the words of real people, it stakes a claim to reality. But in striving for authenticity it also seeks to disguise its own dramaturgical sleight-of-hand. Nevertheless, the makers of Chilcot avoid such pitfalls by embracing their own bias through subtle humour and self-awareness. Despite Chilcot’s schematic structure, the cumulative effect of these on-stage account forms a powerful whole. The cast fully inhabits their political alter egos, with Raad Rawi totally embodying Blair’s hubristic refusal to admit regret. What’s more, in capturing every verbal tick, intake of breath and delayed response, each performer casts a critical eye on the otherwise inscrutable and taciturn responses of its subjects.